Don’t you just hate the chafing of your skin and the sore muscles that you get on crutches? If you hate crutches but have to keep your foot non-weight bearing, there’s good news for you. Read on to find out about the alternative to crutches that’s sure to give you relief and better mobility. I Need Advice…Knee Scooter Or Seated Scooter? Can You Kneel Comfortably On Your Affected Leg? Are Your Surroundings Very Tight Or Small? Do You Have Good Balance? Were You In Generally Good Health Prior To Your Injury And Not Challenged By Normal Ambulatory Activities Like Walking, Using Stairs Without Holding On To A Railing, Etc? Are You Willing To Spend Some Time Learning Or Do You Expect To Be Totally Mobile As Soon As Soon You Receive It? Are Navigating Stairs A Must In Your Surrounding? Knee Scooters are scooters with an added platform for the injured leg. You can kneel and rest your leg comfortably on the platform, while your good leg strides to move the scooter forward. They are easy to use and gives you a bit of a free hand. 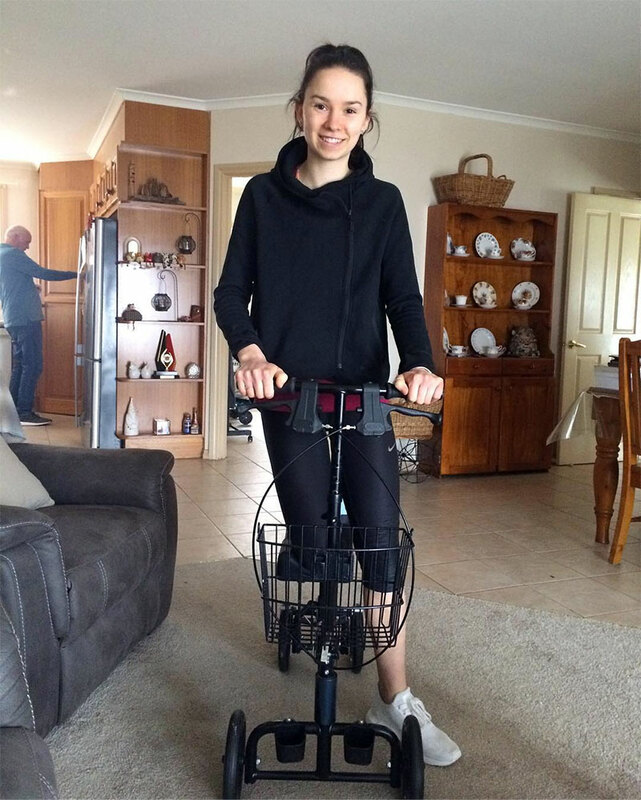 The Knee Scooter is a great alternative to crutches for those who aren’t as physically active or as balanced. Unlike the Hands-Free Crutch, you don’t need to take the time to learn how to use this device. This stable wheeled cart allows you to rest your injured leg on the cushioned knee platform keeping all weight off the healing foot or ankle. You propel yourself with your good leg. 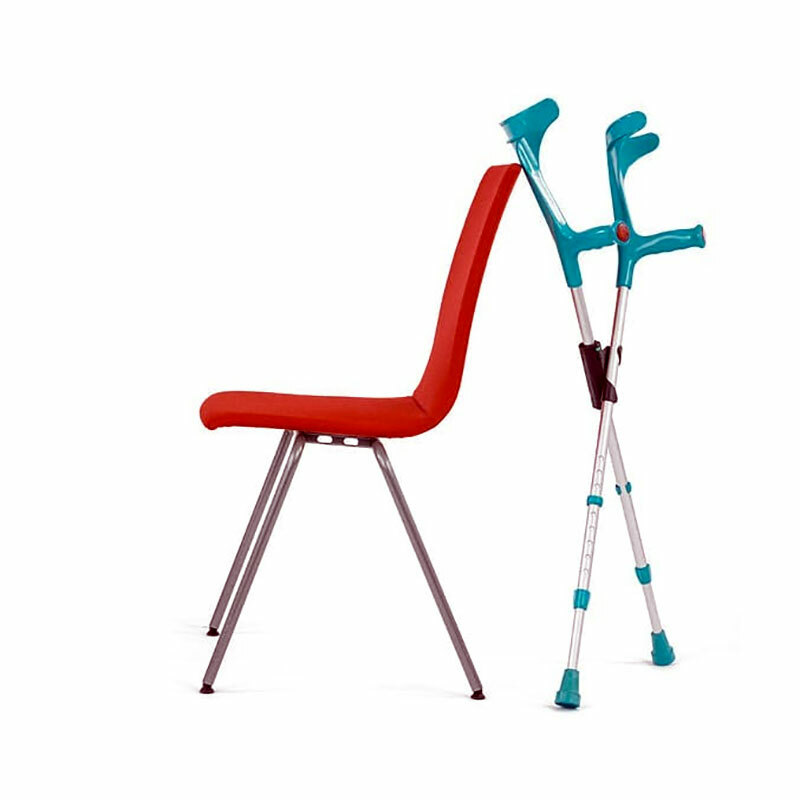 The best units turn like a bike, adjust for right or left leg injury and can be folded for easy storage and transport. You may hear them called Roll-a-bouts after the original manufacturer. Find out the best knee scooter for your needs. But what if you can’t kneel comfortably due to an injury or previous conditions such as knee arthritis? 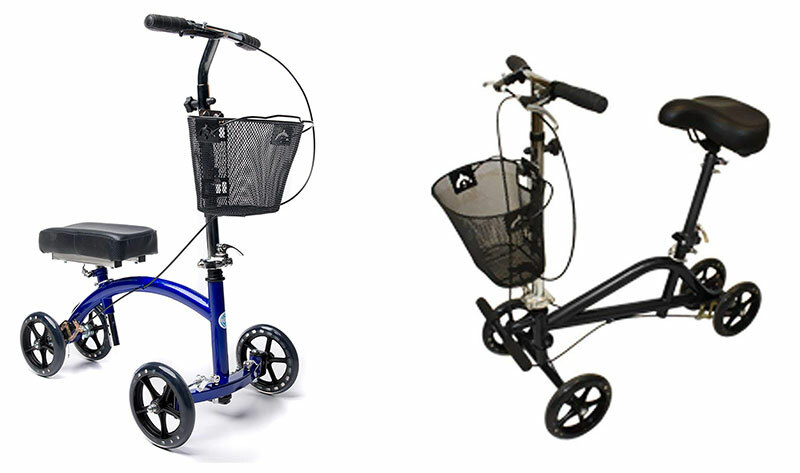 If you can sit comfortably on a large gel bike seat and propel yourself with your good leg, then the Seated Scooter may be the perfect alternative to crutches. 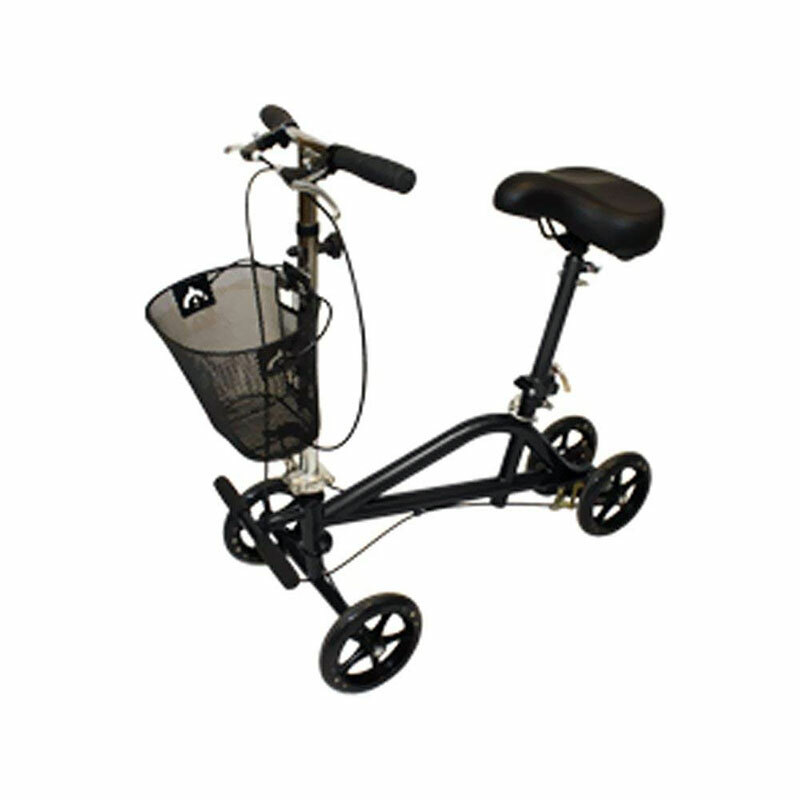 Like the knee scooter, it turns and can be folded down for easy storage and transport. The basket allows you to carry light items. The Seated Scooter doesn’t have a platform for kneeling. Instead, it has a seat and a support for the whole of your injured leg. You can use your other leg to move the scooter forward. If you’re not allowed to put weight on your hip or knee, then you need the Seated Scooter. Like the Knee Scooter, it doesn’t take the time to learn this device. The Knee Scooter and the Seated Scooter usually comes with a basket. There are a lot of brands out there, but they are all different. Make sure to do your research before you buy. You don’t want to get stuck with one that is too small for you or too bulky to go anywhere. “Lord, please tell me if you want me to Kneel or to Sit”. A good test is to try kneeling on a padded chair for a few minutes putting your full body weight on it occasionally. Some people due to an associated or previous injury may feel pain. Others that have arthritis may have pain or not even be able to bend their knee enough to kneel. Be honest with your assessment. Were you in generally good health prior to your injury and not challenged by normal ambulatory activities like walking? Do you have enough strength in your unaffected leg to push yourself? Yes: Either solution may work for you. The Knee Scooter is slightly easier to propel due to the position you are in a while using it. Also look at your surroundings. While both have large 8″ diameter wheels that can go over cracks and through a carpet, the harder and smoother the surface, the easier it is to propel yourself. No: You may want to consider a powered device like a wheelchair. Yes: The Seated Scooter may be more challenging. While it turns just like the Knee Scooter, it has a longer base for stability. The Seated Scooter is 6″ longer than our Knee Scooter. Some people evaluate both options to determine which will best meet their mobility and stability need while matching their particular lifestyle. Some will even use both: the Knee Scooter in their apartment and the Seated Scooter at work. With all of the scooters, the biggest limitation is stairs. If you have relatively good balance and can kneel comfortably the Hands-Free Crutch may provide the unmatched mobility and freedom you need. The prosthetic like device straps onto your thigh and calf. You can even sit with it on although it can be easily taken off and put on. Commonly referred to as a “Peg” by many users, most people use a cane in their good hand for the first few days as they gain confidence and get accustomed to the Hands-Free Crutch. Want to have great mobility and the use of your two hands back? Then this is the great alternative to crutches for you. It straps on your thigh tightly and has a platform to which your injured foot can rest. It has a padded platform for your leg, so you kneel in comfort. No longer will you have that upper body soreness from crutches. You control the hands-free crutch by swinging you’re tight forward. You can walk with it to almost everywhere. Up and down the stairs? No problem. Take them outside, even in the sand at the beach or in the snow or winter! And because your hands are free, you can now carry your plate, play with kids, and open doors for yourself. No need to walk looking down and pushing your glasses up as it slides, you’d be walking tall and looking forward! To be a candidate for the Hands-Free Crutch, you need to be willing to spend a few hours practicing, so your body gets used to it. You need to be allowed to put weight on your knee, and you must have a good balance. If this is you, then you are lucky to qualify to the best way of getting around and staying active while injured. If you can’t bear weight on your foot or ankle, but you can comfortably kneel you have two possible alternatives: Knee scooter or hands-free crutch. But which is best for you. While everyone’s needs and abilities are unique, here are some questions to honestly ask yourself when deciding which is best for you. No: You will want to consider the Knee Scooter, but make sure you have the leg strength in your non-affected leg to propel the scooter. Yes: The Hands-free Crutch will take some time to get accustomed to. Many people use a cane in their hand opposite the injury for the first few days as they gain confidence in the device. No: The Knee Scooter has virtually no learning curve. You’ll be fully mobile your first day. Do You Weigh Less Than 275 Lbs And Have A Maximum Thigh Circumference Less Than 27″. Some people evaluate both options to determine which will best meet their mobility and stability need while matching their particular lifestyle, Some will even use both: the Hands Free Crutch in the house where they have to navigate stairs and the Knee Scooter at the while out at the mall or at work where they have longer distances to go. So you injured yourself. Life goes on! Unfortunately, with your situation in life, you simply cannot keep up with daily activities on crutches. And that is where the iWALK2.0 comes in as a modern alternative to crutches. The iWALK2.0 is a newer, even better version of the original iWALKFree Hands-Free Crutch. You simply strap the device onto your injured leg and walk like normal…your hands-free at all times! 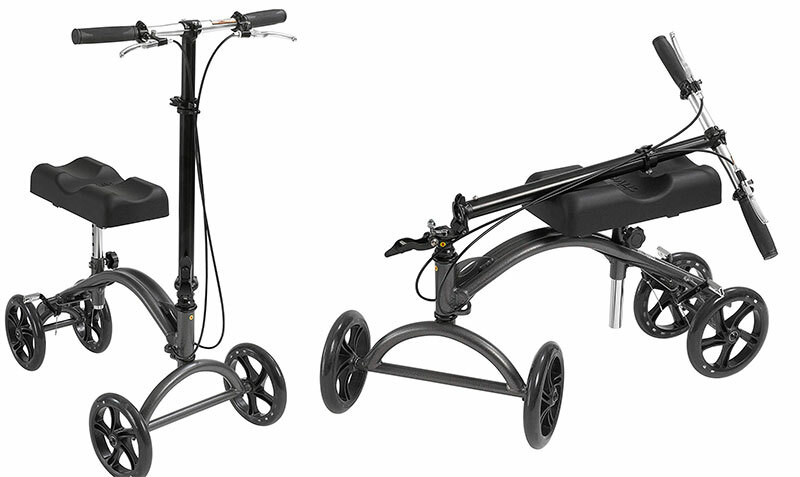 The iWALK2.0 is perfect for many different people. Here are just five examples. Just because you injure yourself does not mean your dog will walk himself every morning and every evening. Your pet might look at your with sympathetic eyes, but he will still need his usual care! On crutches, it would be downright dangerous to take your dog for a walk. If he pulled the wrong direction and got you off balance, you could be worse off than you already are. But with the iWALK2.0 you can keep up with your dog no matter what his pace. You’ll get in a little exercise and fresh air for yourself as well, and you won’t even be sore because of it. When you need to get to class in a hurry, there’s no way you can carry books, operate crutches, and still make it. The iWALK2.0 allows you to walk quickly WHILE carrying whatever you need. You can easily take the device off and sit during your class and then strap it back on in seconds when the class is over and head to your next activity with your books and papers in tow. If your life includes stairs, and most people’s do, crutches are a nuisance. If you need to go upstairs, you will need your crutches when you get there to help you around. But how do you get yourself AND the crutches up the stairs without falling back down with them in a heap? The iWALK2.0 is a great option for anyone who has a two-story home, has to climb stairs at work, or encounters stairs at any time. You can use the iWALK2.0 on stairs, and you will feel safe and secure. You can hold on to the railing because both hands are always available. Plus, once you get up the stairs, your mobile device is already with you to help you out along the way. When was the last time any mom thought, gosh, I could do without the use of my hands for a while! Never! In fact, moms usually wish for MORE hands. So when a mom is taken off one foot and placed on crutches, losing both hands AND a leg can be downright impossible. The iWALK2.0 allows mom to carry a child, the groceries, the diaper bag and anything else as she gets around AND stays off her injured leg. She can cook supper, diaper the baby, play with the kids outside and anything else that her daily life includes. The lawn needs to be mowed. Regularly. Mow it on crutches? Ha! Not happening! Hiring someone to mow the lawn is expensive, and if the kids aren’t old enough to help, dad is going to have to figure out a way around his injury. The easiest way around it is to utilize the iWALK2.0. Wearing this device allows dad to walk like normal and mow the lawn just like he did before his injury occurred. There are plenty of others who can benefit from the use of the iWALK2.0….a chef who uses his hands all day everyday…a businessman who travels and can’t carry his bags while using his crutches…a teacher who has trouble writing on the chalkboard while balancing on crutches…and so on and so forth. 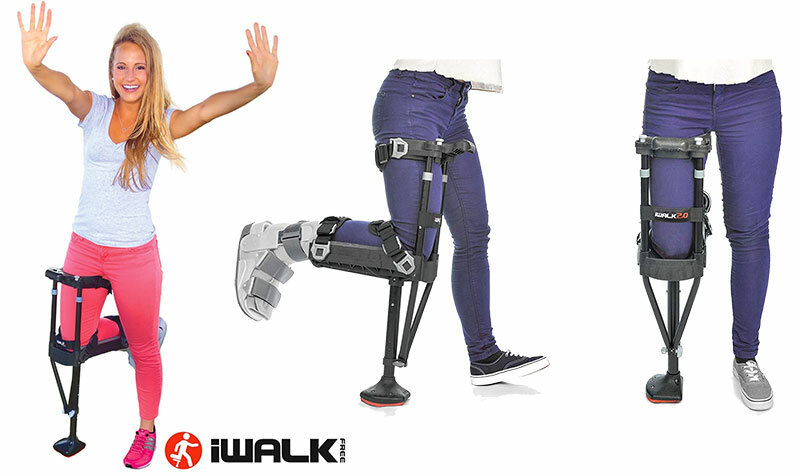 The iWALK2.0 is available to anyone and everyone, no matter what the situation in life. It is an easier, safer, faster way to get around and it allows you the use of both of your hands at all times. When it comes to having a non-weight bearing injury, nothing beats using a mobility device like the iWALK2.0 to make life as easy and normal as possible. I suggest that you look at crutches in three categories: Standard underarm crutches, standard forearm crutches, and other models (including the underarm ones with long arcs, forearm crutches with spring suspension (like the In Motion), and ones with other unusual features like knee rests. I can tell you having used both wooden and aluminum underarm crutches (correctly so they don’t push into the underarm), several models of regular forearm crutches (open plastic forearm rest, encircling forearm rest), and the I Motion forearm crutches (molded silicon grips, springs in legs) there are huge differences and just calling them crutches leaves your audience without key information, particularly as most people have crutches, as well as a, knew walker or whatever. I really like my inMotion crutches much more than any others I’ve used over many years of for and ankle injuries. With very little practice the lever action of forearm pushing back while the body moves forward common to all forearm crutches becomes second nature, the silicon grips are at an angle where my wrist problems aren’t aggravated and my hands don’t get tired from hanging on as you don’t really, and my shoulders are much less uncomfortable than with any of the others because the spring action prevents them from jarring. I also like that as with some other forearm crutches the bands around my forearms allow me to use my hand, such as to open a door, without worrying about dropping the crutch, yet they’re ready to put on even over winter coats. Someone with small diameter forearms might want to reach out to the company for their smaller size of these bands for a better fit.